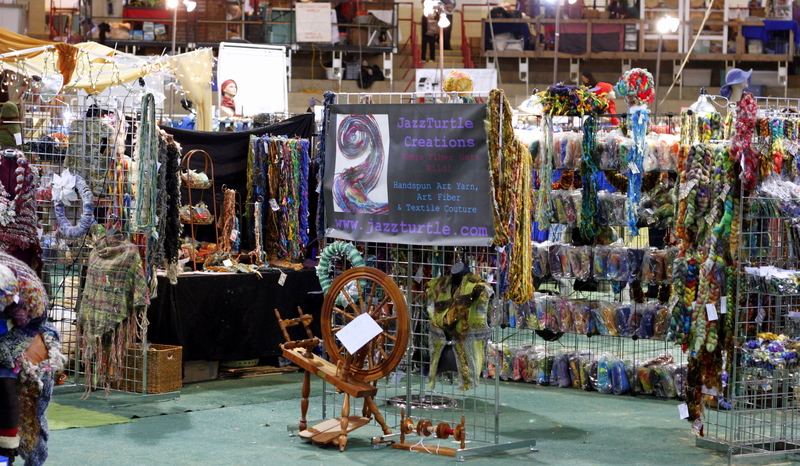 What a wonderful way to celebrate Fall, with the Southeastern Animal Fiber Fair (SAFF). Teaching and vending- We packed the trailer and headed to Asheville, NC, which is nestled along the Blue Ridge Parkway in the Great Smoky Mountains. 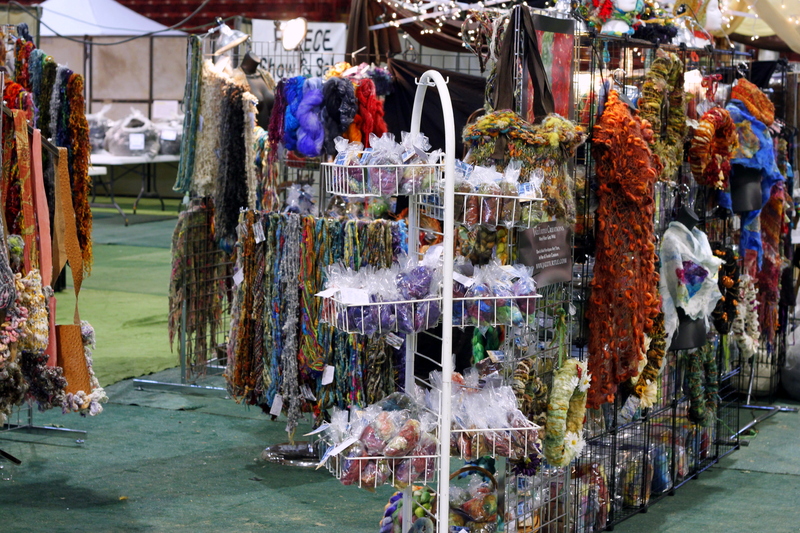 This was my first SAFF as a vendor, last year I was only teaching. We had an AMAZING spot on the floor of the arena! 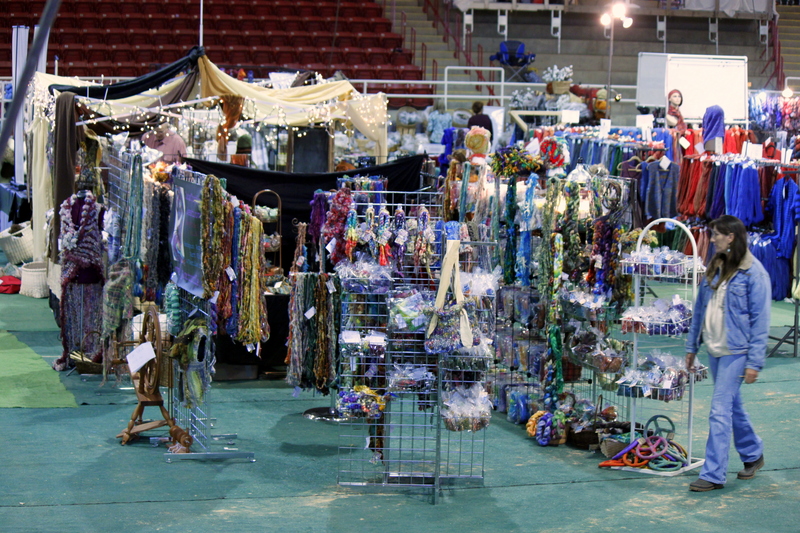 Huge visibility area, right in front of the Fleece and Fiber show! Perfect for me to swoop in and grab the “Best in Show” Alpaca fleece (white huacaya) as well as 3 long white suri and a small rose grey cria suri fleeces. We had a WALL of batts, along with more than 40 colorways of locks and fleece, 5+lbs of silk textures- mulberry, tussah, hankies and cocoons, 30+lbs of hand dyed tops and lots and lots of art yarns! As usual, the tailspun and cloudspun were the most popular- but everything was being fondled, pet and purchased! It was so exciting to see happy people, and talk about patterns and ideas for their purchases! I also taught 4 amazing classes! I had a large fantastic “Corespinning for Funk and Function” class, and 3 totally awesome “Wild Carding” classes. Everyone picked up the technique in the corespinning class, and we were able to add funky bits and bobs, as well as work on a bit of tailspinning. Each carding class was unique- everyone’s batts were beautiful. There were felters and spinners- shepherds and farmers… everyone working with eachother to create beauty. I love teaching so much! Roo (Moonwood Farms) and Me- Notice I'm wearing an AWESOME Girl with a Hook hat! I was able to take a quick walk around to say hi to friends and other vendors. This is my favorite part of festivals and shows- meeting up with people we really only see when on the road! Hugs from my favorite artist Conni Togel (of Sheep Incognito) and picked up the new 2012 calander for our kitchen, a wonderful visit with my fave yarn dyer, (Creatively Dyed), caught up with my fave GA cotswold/bfl and cormo/bfl farmer (picked up a few fleeces and ordered some that weren’t at the show) and then went to the sales barn for chilly hugs from the awesome ladies out there-KnittyandColor, LunabudKnits and Roo from Moonwood Farms (was gifted some YUMMY alpaca and traded for some cria fleeces- and Power Scour- Roo is a retailer and she’s on a mission to convert me from Dawn..
After the fastest breakdown EVER (thanks to Deb, Kim and Lenore!!) 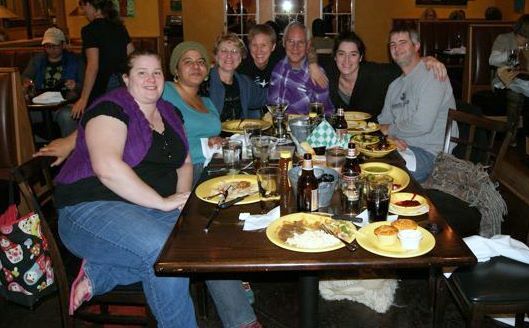 we were able to meet friends at one of our favorite Asheville eateries, Tupelo Honey Cafe. Along with some SAFF staff and board members, we were joined by Otto and Joanne Strauch of Strauch Fiber Equipment and Jacey Boggs of Insubordiknit. 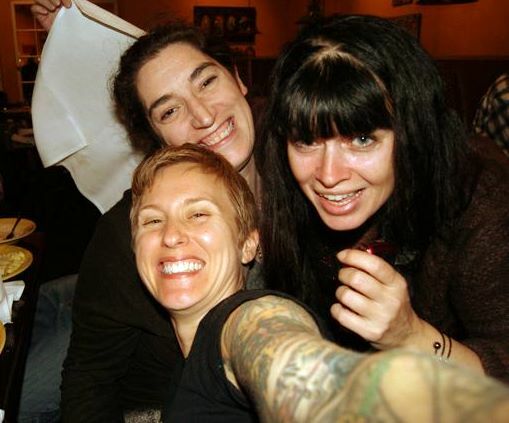 I know Otto and Joanne well, and we always try to catch up when we are at shows together; but this was the first time I’d actually hung out with Jacey (other than a brief car ride from Baltimore to MDSW last year). It was a blast hanging out with everyone and decompressing from an eventful weekend! Roo came at the end for some last minute hugs and giggles. All in all this was one of the best weekends I’ve had as a teacher and a vendor! I can’t say enough about how much hard work the SAFF board did with advertising and the new teaching space! It’s always wonderful to see friends and meet new ones! 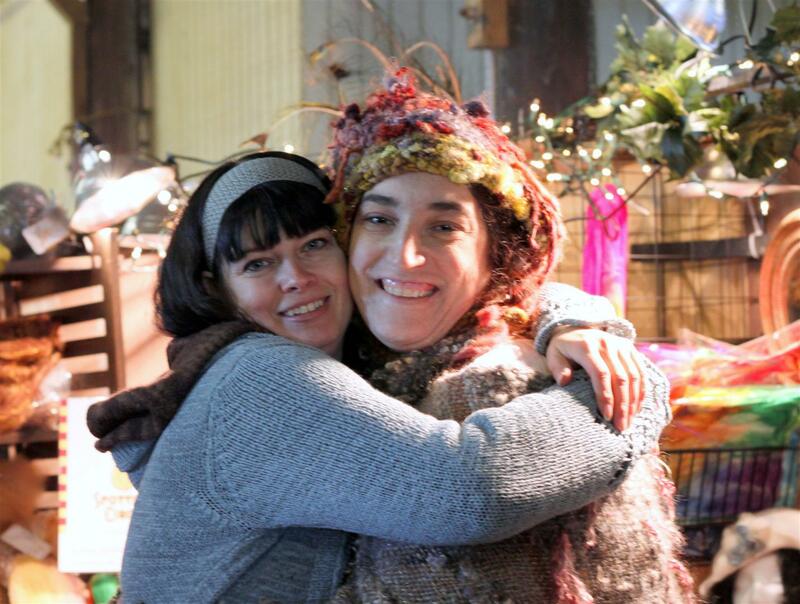 I got to meet customers and see creations- and inspire more creations! Of course I got to pick up the most amazing fiber which is always icing on the cake! Happy Fall and Happy SAFF! ← Stitches Midwest, 2011 – Thank you Schaumburg! of course like your web site however you have to check the spelling on several of your posts. Many of them are rife with spelling issues and I find it very troublesome to tell the reality nevertheless I will definitely come back again.